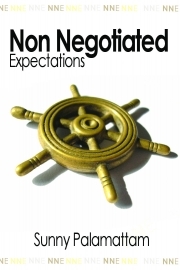 Description of "Non Negotiated Expectations"
As a mentoring tool for success, here’s a book with a difference. In a non-technical language this book explains how to have a greater control over your emotional challenges. Irrespective of the past, going forward this book ensures a blunt and practical approach to most of the modern day people problems. This book provides the blueprint for all of us to reinvent ourselves to fit the bigger picture that we carry in our mind. The knowledge presented in this book will help if you are willing to push beyond what you think of, as your personal limitations. All it takes is discipline, practice and time to apply this knowledge in your daily life. While we can easily acknowledge it, how many of us can effectively manage our Emotional Stance during a Crisis and think above and beyond the immediate. Universal Truth being, most of us are emotional being and experience over hundred different emotions like Fear, Frustration, Anger, Hatred, Envy etc. at any given time. Unfortunately we cannot delete our various emotions and say, I am done with that puppy. For example, for an emotion like Frustration, we cannot say that in future, I am never going to get frustrated. But we can learn to manage our frustration (as this book shows) on a given subject, with given set of people, in a given situation a little better. Unfortunately such skills are not taught in schools. My main objective is to present a book (almost like a Text Book) which could help upcoming students in India to develop their soft skills required to compete in the world market now a days. This book will also try to expand on the theory of our Belief System and how we can reverse engineer the entire process to understand and grow out of the boundaries that have been laid by the belief system in our country. Reviews of "Non Negotiated Expectations"
Talk of self improvement, and names such as Dale Carnegie, Norman Vincent Peale and Orison Swett Marden come to mind. Sunny Palamattam’s work seems to be along different lines. It is a well studied work, and I am sure the author has drawn much of what he says from his experience abroad, from others' experiences, as well as from his own knowledge of human affairs. Whether a person is a grocer, a student, or a manager, there's one thing that he needs to achieve, and that is emotional maturity. And as Darwin says, it begins with being able to control our thoughts. How many of us can do this successfully? No wonder Darwin says that being able to control one's thoughts is the highest stage in moral culture. So how vitally important it is to be able to control what we think ! This book is an important work in self-management. It is going to help a person understand himself better, control himself more effectively, get on better with others, and develop a success oriented approach. It will help him in his relationships with others too. I feel this work is essential for anyone who wants to live a fuller, more meaningful life. Anyone will profit by a reading of this book, for it really touches core issues. Students, housewives, aspiring managers, professionals -- anyone who wishes to understand himself better, and is looking for a way to live a fuller, more meaningful life should have a copy on his bookshelf. The author writes with intensity and earnestness, yet using language simple enough for anyone to understand : ample evidence to show that he is deeply committed to the subject he has chosen to work on.